In a heavy large enamel cast iron pot heat the olive oil, butter and the garlic over medium heat. Once the garlic is brown, but not burned, remove and discard. Add the onions and carrots and mix well. When the onions are translucent add the meats (beef, veal and pork) and separate well with the back of a wooden spoon. Add the tomato paste and mix well. Cook the meats until all the liquid is evaporate. Add the bay leaves, red wine, chopped porcini mushrooms, half of the strained mushrooms liquid. Mix well. Add the tomatoes, salt, pepper and sugar. Mix well, lower the heat to simmer, cover and cook stirring occasionally for 1 hour to 1 ½ hour. Taste and adjust the salt and pepper to your liking. Add more wine if too dry. Cook uncover for another 30 minutes. Sunday night is always family dinner night and with such, our dinner is a lot more elaborate. 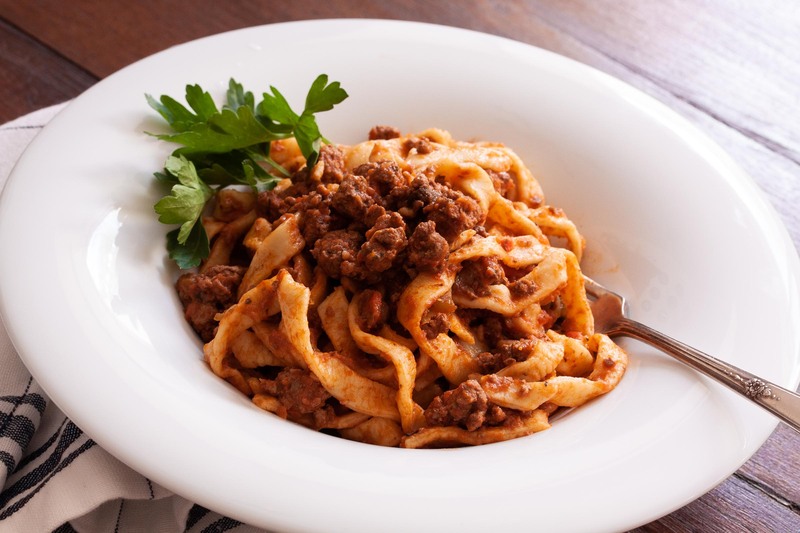 Ragu alla Bolognese is a classic meaty rich and savory sauce served with tagliatelle, a traditional pasta and dish from Bologna in Emilia-Romania. 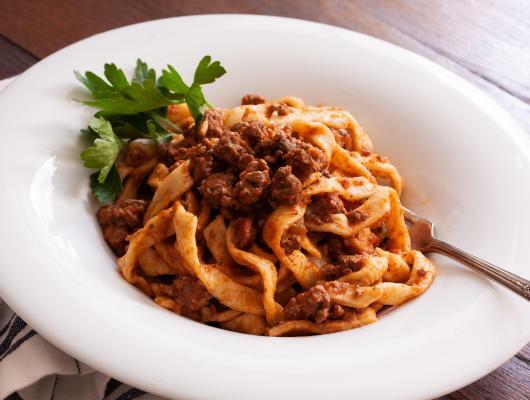 This sauce is also used to make lasagne alla Bolognese. There are as many version of this dish as they are chefs. This is one of our favorite that my nephew, Timothy, prepared for us and I have been making since. I usually prepare it in the morning and let it rest before dinner. It perfectly saves in the freezer, so do not be afraid to freeze the unused portion for another night during a busy school night.